We have been hoping and planning for this move to Portland for quite a while, but we weren't sure if or when it would work out... so earlier this summer we went ahead and made plans to come to Maine for a week, for a wedding of friends, to visit other friends and to do some camping. We had no idea when we made our plans that it would end up being the week before our move, but we decided when we knew we were moving that we would just go anyways and plan on getting completely packed before we left. Well, I wouldn't say we are completely packed, but we are close enough that we will be ready by the time the movers come when we get back, and I have to say that a week off in one of our favorite places is just what we needed after the stress of packing so intensely for the past few weeks. Right now we are staying with friends who have internet, so I am taking the chance to finally post about a few projects that I had made in my last few moments at the sewing machine, but not had time to post about! I had wanted to make the Jamie Dress by Sis Boom ever since I saw the beautiful dresses coming out of the Sew-along run by Sara of Sew Sweetness, and I decided it would be the perfect dress to wear for this upcoming wedding (and the trip to Hawaii that we're taking while our stuff moves across the country!). I bought the pattern from Pink Chalk Fabrics, since I could automatically download it, and the fabric is from Jane Dixon's Garden Party line, which I got at Hawthorne Threads. I was nervous about cutting into such a large piece of fabric, so I made a muslin using a thrifted sheet - the muslin was just for a top, which I figured I would wear if it turned out well. I actually didn't finish it yet because I was so anxious to get started on my dress, but there were a few things I decided to do differently after making the muslin so I am glad that I took the time to do it. The biggest thing that I changed was to distribute the gathers in the bust evenly across the entire front of the bodice, rather than only in the center - this was a change that I saw a number of other folks in the sew-along had done. On the muslin it is too poofy/full in the center of the bodice and it looks kind of funny; I like the way it looks in the dress much better. Also, for the dress I cut the skirt more as an a-line shape (with a slightly curved waist and hem) than as a straight rectangle, to reduce the amount of fabric gathered at the waist (another idea suggested by folks in the sew-along). 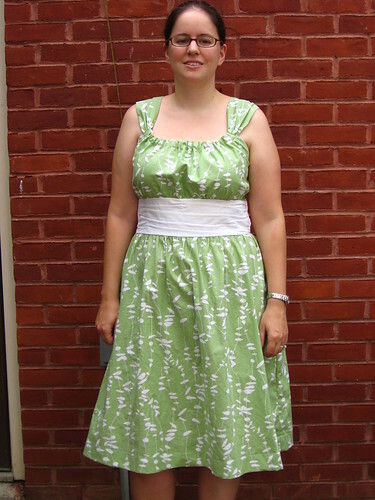 I also continued the waistband in the back - figuring out how to alter the pattern to do this was a bit tricky and the way I did it in the muslin meant I had to change the dress' construction slightly, so I was glad that I had tested it out first. I have a lot of zippers in my stash, so I always assume that I will have one that works for any project, but I don't actually always have just what it is called for. Which is why the zipper on this dress is somewhat shorter than what the pattern calls for, and is lavender. Although I actually like the little (mostly) hidden bit of color that it adds! I used my walking foot to topstitch down the zipper, since I was having a hard time getting it too feed properly, especially at the waistband. And the pattern says so use a gluestick to position the zipper, but I couldn't find mine (I'm going to blame the packing/moving situation not my general level of disorganization), so I just used pins and it turned out fine. I love how this dress turned out - and it's the first piece of clothing I have sewn for myself that isn't a knit in probably 15 years, so that makes me extra excited about it! I found all the tips and ideas from the sew-along super helpful, too, so I will definitely be keeping an eye out for more sew-alongs to follow either at the time or after the fact. I can't wait to wear this dress to the wedding next weekend! Great dress! I love the confidence to make changes to the pattern. Yay for the move to Maine. We are going there this week for a vacation- I have never been before. I am so looking forward to it. I love this dress! And thanks for sharing all the details. The changes you made are fantastic! And thanks for entering it in "this lovely summer dress challenge" over on my blog! Great dress! 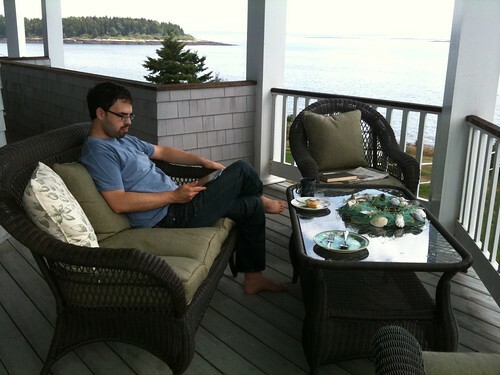 The color looks fantastic on you :) And how I WISH I was enjoying a cup of tea on that front porch.....beautiful! What can I say, but job well done - that fabric looks great on you, lovely colour. I also have to say that the view from the porch looks amazing. I *love* it! My favorite color is green! 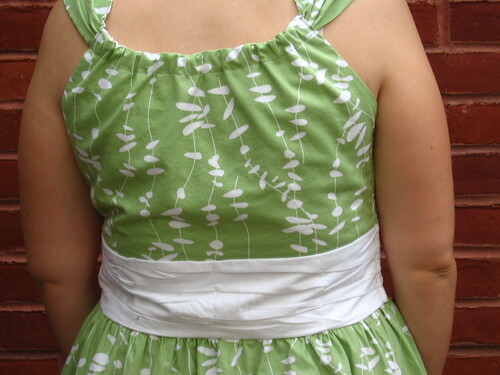 I love that you made the waistband go all around to the back...so lovely! It fits you perfectly! Very cute! I love that fabric-- it's perfect for summer! I also think it's amazing that you know how to sew clothes and they fit! For some reason this just seems like magic to me :) Hope you're having fun on your trip! New Storefront and Moving Sale!